The headline referred to this study, just published in the Journal of Epidemiology. The researchers in Maastricht looked back at data from a Dutch survey on diet and mortality conducted from 1986-1997. They found mortality rates of nut-eaters were 23% lower than people who reported eating no nuts. 23% lower mortality corresponds to 2½ years of life extension [how to calculate]. Threshold for the benefit was quite low at a few ounces per week, and more was not better. (Past studies indicated that perhaps more is better. I eat about 2 pounds of nuts in a week, perhaps over the top, because I like them and because I’m on a low-carb vegetarian diet. There is no data in that range.) Peanuts were found to be just as good as “tree nuts” (almonds, cashews, walnuts, Brazils, etc.) but peanut butter had no benefit whatever. By itself, a finding like this is hard to translate into a dietary recommendation. There are qualitative problems with methodology. People are different, and a diet that is right for one person may be all wrong for another. And if we eat more nuts, are we adding more calories? Or are we eating less of something else? There is also the quantitative problem of cross-correlations–correlation does not necessarily imply causation. People who eat nuts are likely to be richer and better educated and more careful about their diets, likely to be eating less unhealthy snacks, less meat, less carbohydrates. Any of these things could produce an incidental statistical association between nut consumption and longevity, with no indication that eating nuts confers a benefit. It’s common to correct with multivariate analysis, but multivariate analysis doesn’t work very well if there are more than a few variables, and it’s hard to know in advance which are the relevant ones. Statistics ends up being an art as much as a science. So the study gains credibility when previous studies, with different methodologies in different populations, come to the same conclusion. There are several, the biggest and best of which are this one and this one. With write-up of the new study, the authors include a “meta-analysis” of these past studies. This is another layer of statistics which combines previous results to come up with a conclusion stronger than any one study could draw. Meta-analysis is a pursuit that can keep a data geek happy and productive for weeks on end. Happiness and productivity are both positively correlated with life expectancy ☺. In these analyses, the HR estimate for each study was weighted by the inverse of the variance of the log HR to calculate the summary HR and its 95% confidence interval (CI). Heterogeneity between studies was estimated using the Cochran’s Q test and I2 (the proportion of variation in HRs attributable to heterogeneity). Publication bias was assessed by the Begg test. In addition, we performed dose-response meta-analyses using generalized least squares regression described by Orsini et al. with restricted cubic splines (four knots, at 5th, 35th, 65th and 95th percentiles) to investigate potential nonlinearity in the dose-response relationship. The multi-study meta-analysis results closely paralleled the present study. All the diseases of old age were lower in people who ate nuts; cancer was marginally lower, and cardiovascular disease much lower. Some of the older studies found less benefit for peanuts than for tree nuts, and beyond a few ounces a week, there was ambiguity about whether more nuts offered more benefit. There is comparable statistical evidence for the benefit of eating chocolate! For years, I have refused to take these studies seriously, figuring that they are funded by a consumer industry that is eager to rehabilitate its junk-food image. And in fact, just last month there was a spoof done by a science journalist, intending to remind us how easy it is to lie with statistics. The headline was “Slim by Chocolate”. Here is John Bohannon’s account of what he did, and what morals we should draw. His main point is that we all should use our common sense and be skeptical of sensational health claims. Who can argue with that? But the topic he chose incidentally illustrated other points as well. There are legitimate claims for health benefits from chocolate. People are complicated, and no two bodies are alike. Not only do foods affect our metabolisms differently, but even more various are the psychological effects of foods. There are people who find a little bit of chocolate uniquely satisfying, and it helps them to eat a leaner, healthier diet in many other ways. There are other people who find chocolate addictive, and the more chocolate they eat, the more they want. I find it completely plausible that some people are better able to lose weight with chocolate than without. The psychology of eating is the most individual thing about diets, and it plays an essential role. Time after time, human psychological studies have demonstrated that for the great majority of people, will power is worse than useless in trying to control weight. (Present company, of course, is excluded. You and I both have perfect control over what we eat, regardless of what the statistics may say.) People who set out to lose weight by adhering to a set of rules generally succeed for awhile, then well over 90% bounce back to a weight higher than they started. Habits in themselves are hard enough to change; but in addition we have powerful and persistent homeostatic impulses whispering in our ears. The body gravitates to a “set point” in weight and percentage of fat. The most successful diets all manipulate those signals of craving and satiety with alterations to the body’s biochemistry. We joke about pregnant women having aversions to some foods and cravings for others. Methionine is an essential amino acid, and it is normally part of all protein that we eat (though some sources have more than others.) There have been a lot of studies of methionine restriction, in which mice are fed an artificial diet of re-constituted proteins in which this one amino acid is missing. Despite the fact that methionine has no distinctive flavor or smell, mice know at some level that they are missing methionine. Some researchers report that the mice refuse to eat unless there is methionine in their food. The moral of the story is that our bodies know what they want, and will nag at us until they get it. For some people, phytochemicals in chocolate can play a positive role in regulating gut biota and controlling anxiety that can lead to nervous eating and other destructive behaviors. This new study comes from University of Aberdeen in Scotland, and was published last week in the British Medical Journal. All-cause mortality was not compiled, but the study claims that eating more chocolate is associated with less cardiovascular disease, and the group with highest chocolate consumption enjoyed 23% less heart disease. Here is a meta-analysis of studies in the past that have been less clear and consistent than for nuts. The average is that people who ate the most chocolate had 25% fewer cardiovascular events compared to people who ate the least. No studies have been done about cancer, or all-cause mortality. Translation: chocolate eaters weigh less despite eating more. Did Mr Bohannon stumble onto something that none of us expected? Probably not. Here are two studies [one, two] that find just what we would expect, that eating chocolate is associated with weight gain. People who eat nuts and chocolate have lower rates of cardiovascular disease and live longer than people with comparable amounts of body fat who don’t. If you can adjust your diet to add chocolate and nuts without gaining weight, you will probably benefit. Remember always that diets are individual and the response of your own body is not the average response. This is the era of big data. We are awash in data. What fun for people like me, who love to extract meaning from numbers! Still, answers to basic questions remain elusive. Finding correlations between single foods and particular diseases is a start. But researchers might remember that our goal is to design diets and life styles that are healthy and adapted for each individual. We have a long way to go. More creative and ambitious study designs for the future might help. I’ll have two examples for you next week. Eight years ago, I assumed erroneously that the chute of my food processor was longer than my fingers. I lost a quarter inch from the tip of my right middle finger. Today, my finger has grown back, right down to the pattern of the fingerprint. I am fortunate to be a good healer. This is the extent of regeneration that adult humans can normally expect. Many “lower” animals can regenerate large parts of their bodies when damaged. This includes not just the legendary cases of starfish and planaria worms, but also zebrafish and salamanders. Porpoises that have suffered deep and severe lacerations in encounters with sharks regenerate their skin quickly, without scarring. So why can’t we? p21 plays a role in apoptosis, the elimination of cells that self-detect that they are damaged or dangerous or cancerous. We might suspect that eliminating p21 would increase cancer, but that seems not to be true. Apparently, p21 has both pro- and anti-cancer effects, and in fact, inhibitors of p21 have been studied as a strategy for treating cancer. Mice lacking p21 can heal more effectively, and there seems to be no downside. A headline in Science Daily this week announces identification of a drug that can dramatically increase healing capacity by blocking the enzyme that degrades prostaglandins. Prostaglandins are eicosanoids, fats and oils that serve as signal molecules. (Usually we think of signal molecules as proteins, or less commonly RNAs.) Hormones circulate through the bloodstream and reach the whole body, but eicosanoids circulate locally, which is the definition paracrine signals. If the word “prostaglandin” is familiar to you, it may have an association with headaches. E2 is the most famous prostaglandin (PGE2), and PGE2 is associated with pain and fever. NSAIDs including aspirin inhibit the COX enzymes (cyclo-oxygenase) which have a primary role in creation of prostaglandins. This is not a side-effect but an important mode of action of aspirin. Prostaglandins are pro-inflammatory. We think of inflammation as destruction of tissue, and regeneration as renewing or re-building tissue. So it seems surprising that prostaglandins should be involved so deeply in both processes. But PGE2 is known to be associated both with inflammation and with anabolism, stem cell activity, and tissue formation. Prostaglandins are constantly being created and degraded, signaling on a short time frame. The amount of prostaglandin in the system is determined by a balance between production and destruction. The new drug has already been promoted with the catchy name SW033291, and it is an inhibitor of 15-PGDH, which is the enzyme that degrades prostaglandin. A team of scientists at Case Western (Cleveland) and U of Texas (Dallas) were searching for ways to enhance PGE2, based on preliminary evidence that it could promote healing. They noted that mice lacking the gene for 15-PGDH had twice as much PGE2, and these mice recovered more rapidly after exposure to radiation, or surgical removal of part of the liver. They also had stronger immune systems, with more white blood cells. Also new last week was a paper from the Heber-Katz lab, recently moved to the Lankenau Medical Center. They have identified the protein HIF-1α as a target for therapy, and have preliminary, positive results for an injectible drug that enhances healing power to the level of the p21-null mice by promoting HIF-1α. “Increased expression of the HIF-1α protein may provide a starting point for future studies on regeneration in mammals.” The chemical name of the drug is in the article, but it is not enlightening. In a press release, Heber-Katz reports indications that the drug she is applying de-differentiates some “end-user” cells and restores their ability to act as stem cells. So, What’s the Prognosis, Doc? NSAIDs including aspirin have well-estalished benefits that lead to substantially lower mortality from heart disease, stroke and cancer. NSAIDs work in two ways: (1) reducing blood clotting, which is the proximate cause of most heart attacks and strokes, and (2) reducing inflammation, which is a deep cause of cancer, damage to arteries, and other ailments associated with age. All these benefits are associated with reduced PGE2. The benefit will come when next-stage science learns to tease apart the benefits of enhanced regeneration from the liability of increased systemic inflammation. There is every reason to believe this is possible, but the intervention will have to come at the next level down from PGE2. As for the HIF-1α stabilizers, the challenge at this point is that this approach requires repeated injections of time-release capsules of the drug, which has a short lifetime in the body. Where are the p21 inhibitors? I can find no literature on p21 drugs being studied for regeneration. The brain does its work with electrical signals through a network of neurons. The information is passed to every cell in the body with chemical signals, hormones, RNAs and proteins that are dissolved in the blood. The interface between the electrical and the chemical networks is a tiny region in the middle of the brain, the hypothalamus. Orexin (also called hypocretin) is a neurotransmitter protein, just 33 BP long, associated with wakefulness, alertness, appetite and cravings. Mice lacking the gene for orexin display narcolepsy. They are continually falling asleep, only to waken a few moments later. Orexin is produced in a tiny region of the hypothalamus. Drugs that block orexin have been developed recently as aids in overcoming addiction. There are also applications for insomnia. Orexin makes you awake and alert; blocking orexin helps facilitate sleep. The “rate of living” hypothesis is an old, discredited theory–such ideas take a long time to die. You might expect that orexin speeds you up, so it shortens life span. The opposite is true. Orexin speeds you up, and it increases life span. Mice that are genetically modified to have no orexin tend to obesity–again this is counterintuitive, if you think of orexin as an appetite hormone. Mice that have no leptin (ob/ob) are found to have lowered levels of orexin. They are obese and have shorter life spans. This and other evidence suggests that orexin is beneficial for maintaining insulin sensitivity, avoiding diabetes. Loss of insulin sensitivity is a core mechanism of human aging. We have less orexin as we age. Orexin helps maintain insulin sensitivity. Putting these pieces together, we have a plausible rationale for looking for anti-aging benefits from increased orexin expression. 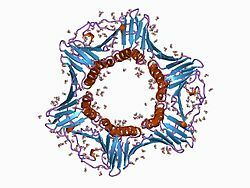 Orexin is not a large protein molecule, but large enough that it won’t survive digestion. You can’t eat it because digestion efficiently destroys proteins, but there is a nasal spray with orexin that is being explored in experiments with animals and humans. NFκB is a hormone that promotes inflammation and is widely regarded as pro-aging. In experiments with mice, NFκB inhibition extended life span by blocking GnRH in the hypothalamus [ref]. Note: I regret that this blog post is turning into alphabet soup. Biochemistry is not my native tongue, and I tend to think that mapping the network of cross-relationships among hundreds or thousands of native hormones is not likely to lead to the silver bullet that we’re hoping for. I’m still hoping that aging turns out to have a basis that is manageably simple, with a few chemicals at the control center. But perhaps we have to map a good deal of the biochemical web before we can identify the controlling nodes. Neuropeptide Y is another small neurotransmitter protein, in the news this spring because of work from the laboratory of Claudia Cavadas in Coimbra, Portugal. Autophagy is the recycling and renewal of large molecules in a cell that become degraded over time if they are not refreshed. Autophagy is dialed down as we age, leading to aging cells and an aging body. The Cavadas group has identified Neuropeptide Y (NPY) as a signal that comes from the hypothalamus, and tells cells to keep autophagy up. We have less NPY as we age, and people with Alzheimer’s and Parkinson’s diseases have less NPY. The Cavadas team notes that NPY in the hypothalamus is increased in rats that are living longer due to calorie restriction. The new experiments added NPY to cell cultures, and found that NPY promotes autophagy in vitro. They went on to the more difficult experiment in live mice, using gene therapy to increase NPY in neurons only. This caused the mice to eat more, so they were put on a feeding regimen where they ate no more than control mice that didn’t have extra NPY. The treatment successfully upgraded autophagy, but left open the question of how much of this was due to caloric restriction and how much to the NPY itself. Previous experiments with rats had shown that whole-body overexpression of NPY leads both to 10% longer life span and better blood pressure control, without weight gain. NPY is also associated with renewal of the immune system. This line of thinking is still largely theoretical. The only practical recommendation is to take melatonin at bedtime after age 50. But it may be that the hypothalamus is ground zero for signals that tell the body how old it is. (Here is a recent editorial from Buck Institute on the subject of neuropeptides and aging.) I believe that the hypothalamus and its secretions are a promising area for new research, and that, over the next few years, basic findings will lead to the most powerful interventions to change the course of aging. The body decies whether food is plentiful (for pregnancy and childrearing) by sensing nutrition and body fat. The body decides either “reproduce and die” or “hang in there and live longer”. The medium for transferring the information is the metabolism of insulin, the pancreatic hormone that controls blood sugar. Insulin resistance (type 2 diabetes) is a primary mode of aging. Sugar and starches quickly become sugar in the blood. Fat and fiber slow the absorption of sugar. Fasting, exercise and foods with a low glycemic index contribute to better insulin sensitivity and longer life. The idea of “negative calorie” foods is very appealing. Are there things that you can eat that actually make you thinner? Are there foods that decrease the insulin impact of a meal, or that lead to lower absorption of food that is eaten together at the same meal? Insulin is a signal to the body that “we have all the sugar we need, thank you. Take your calories and turn them to fat.” Insulin causes fat storage. Insulin is associated with weight gain. Weight gain and insulin resistance, together and independently, contribute to mortality risk. I knew that Glycemic Index (GI) was designed to measure the surge in blood sugar that comes from eating a particular food. It was my naive expectation that sugar would have the highest GI, then starches, then whole grains, then beans, then nuts. I thought that greens and fish and meat would have very low GI. But the GI reference table confounded my expectations on every score. Turns out that this very common-sensical statement is far from true. The first thing I had to learn is that GI is not standardized by energy value of the food, but by grams of carbohydrate. Say a peanut is being compared to a potato. The potato is almost all carb, but the peanut is only ⅕ carb. So when they compare the glycemic response head-on-head, they compare 50 grams of potato with 250 grams of peanuts. Of course, this is going to make the peanut’s GI look bad. The GL is supposed to correct for this, multiplying by a “standard portion”, but the whole idea of a “standard portion” is dubious. By this same definition, meats and salad oils have an undefined GI. This is not because they produce no glycemic response, but because they contain no carbs, so the GI measurement protocol is undefined. Banana cake without sugar has a higher GI than banana cake with sugar. But it has a lower GL. Perhaps you can explain the higher GI of whole milk if you assume that cream is finding a pathway to be burned as fuel within two hours. And the low score for Coca Cola might have to do with burning sugar in response to cafeine. But there are too many questionable numbers in this table for me to have any faith in it. The big problem is in the “portion of food containing 50 grams of digestible carbohydrate”, which can be a very large or a very small portion, depending on the food. Two additional problems are that different people have very different responses, and also that the body’s response to foods tested in isolation is not a good indication of how the body responds to food combinations typical of a meal. In this study, GI for different breakfasts was computed by adding up the GIs for individual foods; when the subjects’ insulin response was measured it had no relationship at all to the computed GI—a correlation of zero. Adding fiber to a meal can reduce the subsequent blood glucose and the insulin spike [ref]. Wheat bran has been used to slow the blood sugar uptake for diabetics [ref]. Green leafy vegetables have a similar benefit [ref, ref]. Resistant starch is, by definition, starch that resists stomach enzymes, and is not quickly digested. It passes through the large intestine, where it is fermented by bacteria that thrive on it. RS may cause flattulence or indigestion. Often the symptoms clear up after a few weeks. Green bananas and raw potatoes are natural sources of RS. You can also buy it as a flour and mix it into foods. This study claims that resistant starch slows starch absorption and damps the insulin spike better than fiber. In this study, RS lowered fasting glucose and improved blood lipid profiles. Glucomannan (konjac), pectin, and guar flour are all reported to have similar effects to RS. Personally, I have a hunch that fiber (and possibly resistant starch) change the intestinal flora in a way that lowers total food absorption. You extract fewer calories from the same food. However, this is almost impossible to measure directly, and to my knowledge the study has not been done. Less controversially, adding fiber or RS to the diet affect your appetite and how full you feel, and affect the insulin response, which influences whether your body burns the calories or adds to fat stores. In all events, I think it’s worth the experiment to see if you can lose weight by adding fiber to your meals. In this context, it is no surprise that long-term studies show that diets rich in green leafy vegetables [ref, ref, ref] and high in fiber [ref,ref, ref, ref] lower the risk of chronic disease. Drinking water with food, or eating foods with high water content, dilutes the food in your stomach. I find it reasonable that this alone should slow digestion, delay the absorption of sugar, lowering the effective glycemic load. Is this a substantial benefit, or is it negligible? I have been unable to find any data on this question. There is good evidence that peope tend to eat less calories if they drink more water, especially right before a meal [ref], so water can be a psychological aid to weight loss. Eating foods with high water content also increases satiety, so that (most people) tend to eat smaller meals, and don’t make up the difference later [ref]. Soups are a weight-loss strategy. Chromium and magnesium. These are minerals with no down side. Recommended for all. Metformin. This is a classic diabetes drug, so powerful that diabetics taking metformin actually have a lower mortality rate than non-diabetics who don’t take metformin according to a Scottish study last year. Cinnamon and vinegar, green coffee extract and irvingia are among many substances that can be taken 20 minutes before a meal to suppress the insulin spike. Is Fructose worse than Sugar? All sugars contribute to insulin resistance and accelerate aging. Are some sugars worse than others? Table sugar is sucrose, a 12-Carbon sugar. It is made of two 6-Carbon sugars, a “dimer” of fructose and glucose. High-fructose corn syrup (HFCS) has more fructose than glucose (55-65%) and honey is similar. Agave is yet higher in fructose. Whether fructose or HFCS is worse than sugar has become a controversial question. Life Extension magazine and Mercola.com are down on fructose, while Examine.com and other health advice sources tend to minimize the difference. Both glucose and fructose go directly into the bloodstream, but glucose is the body’s primary fuel, so the insulin response is determined by the glucose. In terms of insulin spike, fructose is a lot better than glucose. Fructose has a much lower GI than glucose. The sweet taste without the insulin was found in this new study to interfere with natural appetite control, increasing desire for more food. But the difference was not dramatic, as measured either by subjective reports or fMRI. Satiety and hunger are said to be ruled by leptin and ghrelin, respectively. Leptin and ghrelin responses to glucose and fructose were not different in this study. In the liver, fructose is converted not to glucose, but to triglycerides, which are stored by the body as fat. There is broad evidence both from animals and humans that fructose is more fattening than glucose [ref, ref]. This is the basis for the argument that, in the long run, fructose leads to weight gain, insulin resistance, more type 2 diabetes, and thus more accelerated aging than glucose. The best reference I’ve been able to find on the subject is Basciano et al, 2005. Everyone agrees that it’s best to minimize both glucose and fructose. If you prefer to sweeten with glucose instead of fructose, it’s sold as dextrose, not as cheap as cane sugar, but cheaper than honey or agave or maple syrup. A Calorie is a Calorie is a Calorie – Not! “The amount you weigh is exactly the difference between the calories you ingest and the calories that you burn exercising.” We hear this all too often. Writers who should know better promote it as the “First Law of Thermodynamics.” This is dangerous nonsense. In fact, the calorie content of a food is measured simply by burning it and collecting the heat that is released. But the body’s efficiency in use of foods is a very complex affair, dependent on everything from how well you chew your food to which bacteria reside in your intestine. Peanuts do not deliver the body as many calories as peanut butter. There are (lucky?) people with very inefficient metabolisms and (unlucky?) people whose bodies are able to extract every last calorie from any meal. The bacteria that live in our guts digest food for us, but extract a toll in energy that they need for themselves. Depending on the particular bacteria you have in your intestine, the toll may be only 10% of the food energy coming in, or close to half. Roughage slows calorie absorption and helps to move food quickly through the intestine, with less total absorption. Eat as much raw wheat bran as you can stomach, and think of it as a negative-calorie food. A vegetarian raw foods diet is not for everyone, but if you can live with it, it is a sure way to lose weight. Raw foods are poorly absorbed, and from our perspective, that’s a good thing. Weight gain or lost is probably a good proxy for how well you are controlling your glycemic load. I suggest that you use your instincts and your experience to lower your glycemic response to food, and not to waste time with the mysteries in the tables of glycemic index. First cut out sugar, then work on reducing starch. Refined carbohydrates are worse than whole grains, but in my own diet I’ve eliminated all bread, pasta, rice, grains, and potatoes—so I can attest it’s possible. Beans and nuts are good protein sources if, like me, you don’t eat meat. My vegetarian version of the no-starch diet leads to moderate ketosis, less extreme than in a meat-based diet. Combine fiber into every meal. Eat large salads and other green vegetables. Add raw wheat bran and/or resistant starch to your foods. Everyone should be supplementing with magnesium. Consider chromium and metformin as well. Eat soups. Drink water before and during meals. Fasting is a powerful way to preserve insulin sensitivity. Concentrating all your daily eating in an 8-hour window counts as a short, daily fast [read more]. Longer fasts of one to four days have major benefits [read more]. Exercise is the best general tonic for general health. Exercise before meals in particular is a great habit to culture. Even a minute or two of vigorous exercise that gets you panting makes a big difference in your glycemic response to a meal.